Geology is principally a descriptive science. We make observations and propose hypotheses to explain what we see. It is rare for geologists to present a predictive theory that can be tested by making observations that were not documented at the time the theory was proposed. The plume hypothesis was initially proposed by Wilson (1963) and Morgan (1971; 1972) to explain the age-progressive chains of volcanic islands that stretch across the ocean basins. Wilson (1963) reasoned that these volcanic chains were produced by plates moving over stationary “hotspots” in the mantle. Morgan realized that if Wilson’s explanation was correct “hotspots” must comprise mantle plumes originating from deep in the mantle, probably the core-mantle boundary. Since then improvements in our understanding of low-Reynolds-number plumes, initially from laboratory experiments but later confirmed by numerical models, have turned the Wilson-Morgan explanation of oceanic volcano chains into a quantitative predictive theory. Many of the predictions, such as the size of a plume head and the nature of the associated uplift, are unambiguous and exacting. Plume theory stands or falls on the accuracy of its predictions. Picritic magmas should be produced early during melting of a plume head, be most abundant near the centre of the head and less abundant towards the margin. The most obvious of these predictions is that plumes must be hotter than the adjacent mantle. This issue remains controversial. Attempts to resolve the matter by extrapolating observed olivine-melt compositions to primary mantle melt extraction temperatures have proved inconclusive. Falloon et al. (2007) and Putirka et al. (2007) use the same data from Hawaii and MORBs, and the same basic approach, to come to very different conclusions (see Chemical Geology 2007 Special Volume on Mantle Plumes). Putirka et al. (2007) suggest that Hawaii is 268°C hotter and MORB whereas Falloon et al. (2007) find no temperature difference. The problem may be that the extrapolation exceeds the constraints and that the approach cannot yield unambiguous results. A more direct approach of obtaining plume temperatures is from the thickness of oceanic crust produced when a spreading centre overlies a plume, using the method of McKenzie & Bickle (1988) to calculate the temperature of the underlying mantle. 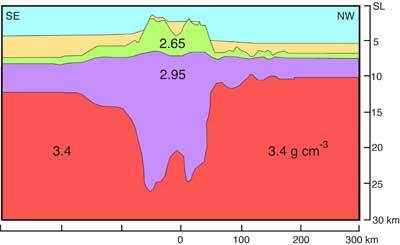 Normal oceanic crust is 7 ± 1 km thick. 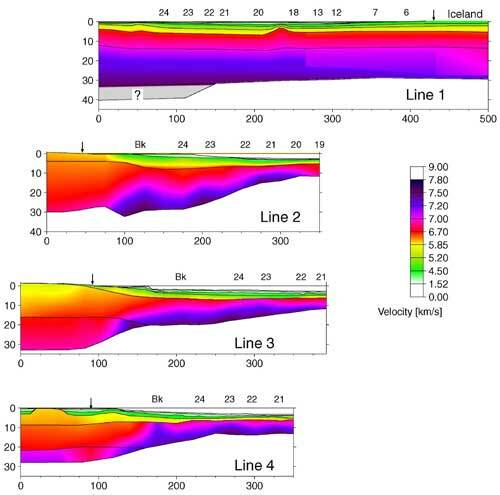 The thickness of the oceanic crust beneath Iceland is 40 km and 25 km below the Walvis Ridge (Figure 1), requiring the temperature of the mantle under these ridges to be 250°C and 200°C respectively hotter than MORB mantle. Figure 1. Seismic cross-section through the Walvis Ridge with the interpreted densities of the layers from Goslin & Sibuet (1975). The basaltic root below the Walvis Ridge is up to 25 km thick and ~150 km wide The former requires the mantle that produced the ridge was 200°C hotter than the mantle that produces normal oceanic crust. The latter dimension provides an upper bound for the width of the Walvis plume. Vertical exaggeration X 12. The most exacting predictions of the plume theory are that plume heads flatten to form disks 2000-2500 km in diameter when they reach the top of their ascent, and that the shape of the uplift produced by these flattened disks of hot mantle is domal. The size of the flattened plume head can be obtained from the thickness of the ocean crust along the east coast of Greenland produced when the North Atlantic opened close to the centre of the underlying Iceland plume head. The length for thickened oceanic crust is 2400 km, showing that the underlying zone of hot mantle is 2400 km wide and ends abruptly, as predicted. Equally importantly, the oceanic crust is 17 km thick near its margins and thickens to 33 km at the centre (Figure 2) implying that the temperature excess of the underlying mantle is 120°C near the margin of the zone of thickening, and increases to 260°C near the centre, again as predicted by the plume theory. Figure 2. Variation in seismic P-wave in velocity (km/s) along four traverses at the western margin of the North Atlantic. Arrows show the coastline and Bk the oldest oceanic crust. The numbers along the top are magnetic anomalies. The thickness of the first oceanic crust to form is 33 km and 30 km for Lines 1 and 2 respectively, near the plume axis, and 18 km and 17 km for Lines 3 and 4 respectively, near the plume margin. From Holbrook et al. (2001). A firm prediction of the plume hypothesis is that the main phase of flood volcanism should be preceded by uplift. The magnitude of the uplift depends on the temperature excess of the plume but is expected to be about 1000 m. Uplift is predicted to be greatest within 200 km of the centre of the dome but significant out to a distance of 500 km. Uplift above the margin of the plume head is expected to be only a few meters. There are numerous examples of uplift preceding flood volcanism but the best documented example is the Emeishan flood basalt in China where the unconformity in the underlying limestone allows the shape of the domal uplift to be recorded with remarkable precision. The agreement between the shape of the observed dome and that predicted by Griffiths & Campbell (1991) and Farnetani & Richards (1994) is so good (Figure 3) that no reasonable person could doubt that the Emeishan flood basalt was produce by a mantle plume and that it originated at the core-mantle boundary. Other observations which are consistent with the predictions of the plume hypothesis are discussed by Campbell (2006; 2007). Figure 3. Uplift above a plume head, as predicted by Griffiths & Campbell (1991), compared with the uplift observed at the centre of the Emeishan flood basalt (shown in beige) by He et al. (2003). The uplift is the minimum average value for the inner and intermediate zones as determined from the depth of erosion of the underlying carbonate rocks. Many apparent disagreements of observation with theory are readily explained by considering the physics of mantle plumes. For example, it has been suggested that surface heat flow at Hawaii should be anomalously high if Hawaii sits atop a plume. However, the time taken to conduct heat from the top of the plume, where its ascent is stopped by the base of the lithosphere at ca. 80 km, is 100 Myr. Seismic evidence suggests that there is a thermal anomaly below the Ontong Java Plateau, which cannot be due to a plume head, because it would have cooled in 120 Myr. However, the thermal anomaly below the Ontong Java plateau is predicted to be about 175 ± 25 km thick and to take over 300 Myr to cool. Some “plumes” imaged by seismologists branch like a cactus and thus, whatever it is that seismologists are imaging, it is not a mantle plume. Laboratory experiments and numerical models both show that if one plume approaches another too closely, they merge from the base upward to develop a “Y” or cactus-like shape. However, there are other observations that have challenged the plume theory, four of which I now discuss. First, the ocean floors are littered with short chains of islands that have no associated flood basalt or oceanic plateau and therefore cannot be due to mantle plumes, which should start with a plume head. Until recently, this was a valid criticism. However, recent experiments on thermochemical plumes (Farnetani & Samuel, 2005) show that plume heads can stall at the boundary between the upper and the lower mantle, so that only part of the head ascends into the upper mantle. The part that ascends is effectively a new plume, and because it rises only a short distance, it has head that is only slightly larger than the tail and is therefore difficult to detect. Second, there is no uplift prior to volcanism associated with the Siberian Traps. The Siberian Traps, however, lie on an unconformity requiring some uplift prior to volcanism but the predicted domal uplift at the centre of the flood basalt has not been documented. This might be because it is overlain by sediments in western Siberia (Saunders et al., 2007). Third, the predicted uplift has not been documented at the Ontong Java plateau. This is a difficult one. Uplift can be documented for continental basalts where the arriving plume head raises the continental crust above sea level, which leads erosion and an unconformity. However, the uplift associated with a mantle plume will not raise the floor of an ocean basin above sea level, so no erosion prior to volcanism is expected. Furthermore, the surface onto which the Ontong Java plateau basalts erupted is covered by 30 km of basalt and cannot be observed. Nevertheless part of the top of the volcanic rocks that make up the plateau should have protruded above sea level at the time of eruption if the volcanism had been produced by a mantle plume, as is the case for Iceland and Hawaii today. It is claimed that there is no evidence of erosion on the Ontong Java plateau. However, volcanic ash of Ontong Java origin has been documented in ODP sites 167 and 463 to the north-east of the plateau, which requires subaerial volcanic activity to have occurred. Finally, the size of the Karoo, which appears to extend from southern Africa, through Antarctica to Tasmania (the Tasmanian Dolerites), appears to be too big to be produced by a single plume head. Are two plume heads involved or was this suite of volcanic rocks produced by some unrecognized volcanic process? In all other respects the Karoo, as seen in southern Africa, is a typical flood basalt. Criticisms of a hypothesis such as these are valuable as they encourage focus on aspects that are not fully understood. They are constructive and move the subject forward. Campbell, I.H., 2006, Large Igneous Provinces and the mantle plume hypothesis, Elements, 1, 265-269, 2006. Campbell, I.H., and Andrew C. Kerr, 2007,The Great Plume Debate: Testing the Plume Theory, Chemical Geology, in press. Falloon, T.J., Leonid V. Danyushevsky, Alexei Ariskin, David H. Green and Clifford E. Ford, 2007, The application of olivine geothermometry to infer crystallization temperatures of parental liquids: Implications for the temperature of MORB magmas, Chemical Geology, in press. Farnetani, C.G. and H. Samuel, 2005, Beyond the thermal plume paradigm, Geophys. Res. Lett., 32, L07311, doi:10.1029/2005GL022360. Goslin, L., and Sibuet, J. C., 1975, Geophysical study of the eastermost Walvis Ridge, South Atlantic: Deep structure. J. Geophy. Res., 86 1713-1724. Griffiths, R.W., and Campbell, I.H., 1991, On the dynamics of long-lived plume conduits in the convecting mantle, Earth Planet. Sci. Lett., 103, 214-227. He, B., Xu, Y.G., Ching, S.L., Xiao, L., and Wang, Y., 2003, Sedimentary evidence for rapid crustal doming prior to the eruption of the Emeishan floods basalts, Earth Planet. Sci. Lett., 213, 391-405. Holbrook, W.S., Larsen, H.C., Korenaga, J., Dahl-Jensen, T., Reid, I.D., Kelemen, P.B., Hopper, J.R., Kent, G.M., Lizarralde, D., Bernstein, S., and Detrick, R.S., 2001, Mantle thermal structure and active upwelling during continental breakup in the north Atlantic, Earth Planet. Sci. Lett., 190, 251-266. McKenzie, D., and Bickle, J., 1988, The volume and composition of melt generated by extension of the lithosphere: J. Pet., 29, 625-679. Morgan, W.J., 1971, Convection plumes in the lower mantle, Nature, 230, 42-43. Morgan, W.J., 1972, Plate motions and deep mantle convection, Geol. Soc. Am. Bull., 132, 7-22. Putirka, K.D., Michael Perfit, F.J. Ryerson and Matthew G. Jackson, 2007, Ambient and excess mantle temperatures, olivine thermometry, and active vs. passive upwelling, Chemical Geology, in press. Saunders, A.D., S.M. Jones, L.A. Morgan, K.L. Pierce, M. Widdowson and Y.G. Xu, Regional uplift associated with continental large igneous provinces: The roles of mantle plumes and the lithosphere, Chemical Geology, in press. Wilson, J.T., 1963, A possible origin of the Hawaiian Islands, Canadian Journal of Physics, 41, 863-870.